Before the dramatic views from the behind-stage window at the Shalin Liu Performance Center in Rockport, the Claremont Trio, with guest clarinetist Mark Nuccio, sought to impose a little extra drama of their own in their June 19 concert. We’ll get to that bit presently, as it concerned the second half of their program. 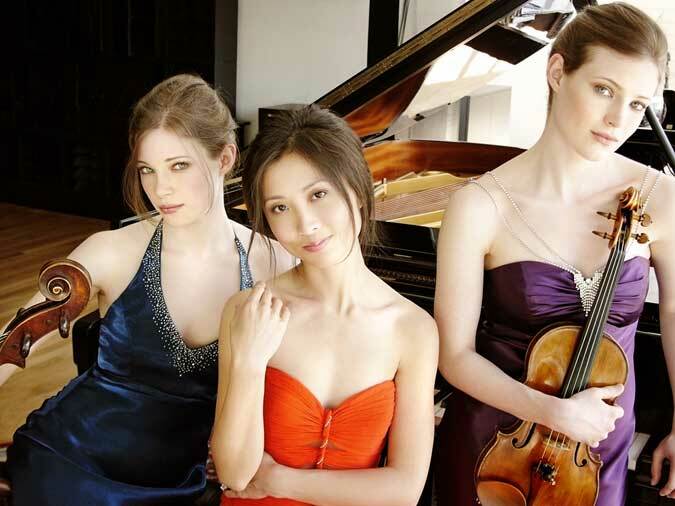 The Claremont, a New York-based ensemble comprising Boston-bred twins Emily (violin) and Julia (cello) Bruskin, together with Vancouverite pianist Donna Kwong, have been steadily climbing in the esteem of chamber music lovers and are now reckoned among the country’s top piano trios, vying for the coveted slot of “the next Beaux Arts.” Piano trio literature is rich and varied, and the Claremont, no strangers to the Rockport Chamber Music Festival but making their first appearance at its new purpose-built home, made no concessions to the commonplace. The program opened with the genial and congenial Trio on Popular Irish Melodies, a 1925 work by Swiss composer Frank Martin (1890-1974), whose music is unfortunately more heard of than heard. The story of its creation was well recounted in Sandra Hyslop’s program note: Martin was commissioned by an Irish-American patron to write a trio on Irish tunes. Martin dug deep into Celtic antiquity, and so instead of the medley on “Danny Boy” and such like the patron expected, Martin produced a fully composed, slightly recondite but fully accessible and entertaining bit of true chamber music. The patron, alas, was not amused, and refused to pay. In the event, the trio is full of archaisms, parallel open fifths and modal harmony, with characteristically Martinesque rhythmic vitality. Often the piano, and sometimes the cello, played the drums or the drone. Without ever losing the flavor of the tunes he quotes, Martin created complex rhythmic and melodic counterpoint that allows each performer to contribute memorable moments. The slow movement begins with a long cello solo, to which Julia B. (for obvious reasons we will contravene our usual editorial conventions for identifying performers) dedicated a duPré-like intensity. The concluding complex jig was a tour de force for the entire ensemble. While all the players were very visibly and vigorously attacking Martin’s surprisingly taut creation, our impression of the overall sound was of an oddly contained expressivity. Hold that thought. The first half of the program concluded with another winsome rarity, the Piano Trio in D minor, op. 11 of Fanny Mendelssohn Hensel. Unlike her brother’s famous trio in the same key, written in 1839 when he was 30, Fanny’s was the product of her last year, first performed by her (and maybe her brothers) in 1847, when she was 42, at a family musicale. In demeanor it is an interesting hybrid of Mendelssohnian fluidity and Schumannesque ardor. Melodically its opening theme strongly suggests, in its dotted-rhythm rising fifth, Felix’s tune from the Reformation symphony, but Fanny was certainly not subsuming her own personality, and despite the occasional — shall we say family — resemblances, she takes the music in her own directions. Among the unique characteristic’s of this work’s sound is its exploitation of the lowest notes of the cello. Formally as well, this trio has some unique personal touches: the score omits any exposition repeat in the first movement, anticipating later practice. Moreover, Fanny eschewed a traditional scherzo for this work, opting instead for a gentle “song without words” that anticipates Brahms’s use of a moderate intermezzo in the scherzo slot. All this said, it remains evident that this trio is good music — even very good music — but not a great masterpiece. Despite its many felicities, some of the musical ideas and their workings-out are fairly pedestrian. That certainly doesn’t mean it should be ignored; to the contrary, it is certainly worthy of a place in the repertoire. What it does require, though, is salesmanship on the part of the performers to highlight its best points. The Claremont are certainly well positioned and well disposed to do this, and their performance had much to commend it. We point, however, to the slow movement as a missed opportunity to conjure the big picture. Whereas the opening movement, which occupies nearly half the work’s length, is bold and assertive, almost (but of course this is never truly the case) “playing itself,” the slow movement has gentle outer parts sandwiching a central section of increasing intensity. Emily B. strove mightily, to great effect, to point up this bit, but by focusing so much on the delicacy of the outer sections the contrasts seemed more arbitrary than organic. There should have been more seething under the lace to carry the larger form. The song, over in a flash, made no great impression. The finale, which was not fully up to the first movement musically, had many neat details, beginning with Kwong’s florid and Chopinesque opening cadenza (another point of difference between Fanny and Felix? He cordially detested Chopin’s writing …) and continuing with the grand struggle for supremacy between minor and major modes (very well presented by the Claremont), as well as an odd and fascinating, if somewhat incongruous, bit of Brahmsian gypsification tossed in. At the close of intermission (an excessively long one considering the length of the program) the woven wood screen was closed across the grand window, much to the dismay of many who had been savoring the sunny day over Rockport Harbor. This, it turned out, was not for the usual reason —this concert, having started at 5 pm, was not going to engage an eye-piercing sunset —but as the first element in the Claremont’s reverse son-et-lumière production to accompany its performance of Olivier Messiaen’s great Quartet for the End of Time. As the trio and guest clarinetist Mark Nuccio entered — changed, in the case of the Claremont, from summery light to raven black — the house lights dimmed to nothing (patrons wishing to consult their programs and reviewers needing to take notes were out of luck this time), and stage lights faded to a minimum. The stage lights then ranged from dim to nil during the eight movements that constitute what many still regard as Messiaen’s magnum opus. We all know the story behind Q40EoT: mostly written at a German prisoner-of-war camp during World War II and first performed there by Messiaen and fellow prisoners; informed by the composer’s twin passions of ardent Catholicism and ornithophilia; the theologically-inspired Bunyanesque pictorialism. The eschatology of Messiaen’s apocalypse is nevertheless mostly a subdued one; except for two movements invoking the towering figure of “the angel who announces the end of time” to the accompaniment of appropriately crashing chords and generally gnarly sonorities in all the instruments and a depiction of the heavens rent by flaming lights, Messiaen’s wartime visions were mostly of the glorious transfiguration that follows the end of the material world (that is, the world of time). Birds, as always with Messiaen, are among the chief harbingers and actors in this process. The clarinet often takes their part, most notably in the unaccompanied third movement (the only one written before Messiaen and his musician friends were taken prisoner), and otherwise in a leading role. Nuccio, currently acting principal clarinet of the New York Philharmonic, was stunning in his entrances from and exits to silence, with a full range of tone and color between. The Claremont was here equally impressive, from Emily B.’s twittering in the first movement to Julia B.’s eerie glissandi and the gentle and ethereal meandering of Kwong’s piano against muted strings in the second. The quiet intensity of the soft passages dominated our impressions, while the long lyrical unaccompanied passages for cello and violin could not have been more perfect offsets to the furious unisons of the sixth and the fiery “rainbows” of the seventh movements, before the concluding, somewhat wistful, meditation on the immortality of Jesus that ends the work (in total darkness). All in all, a riveting performance. We’re only sorry that the players didn’t trust their audience to get it without the somewhat heavy-handed didactics of the light show.